Classic, iconic, storied, bucket list: when it comes to a chance to row on the Thames, all these adjectives apply. There are so many aspects to Thames rowing. There is the raw energy and power as the big eights battle for first place during the famous regattas. There are single scullers training in morning mists, driving rain, hot sun and with flashing bow lights puncturing the dark. There is the elegance of the Henley Royal Regatta, where the spectators are as interesting to watch as the rowing, and there is a break in racing for tea. There is the whimsy of Wind in the Willows evoking a badger in a cravat, a mole in a tweed vest and a toad rowing along the gentle tree-lined Thames to a beautiful home on the banks. History comes to life with every splash of the blades. Rowed boats transported kings and queens in grand pageantry and also ferried commoners. The sport of rowing has been synonymous with the Thames since the early 1800’s. The idea of a tour down the River Thames was immortalized in Jerome K. Jerome’s classic Three Men in a Boat, published in 1889. Many have followed in their blade strokes. British rowers challenge themselves in charity rows, covering huge daily distances from the narrowest point upstream to the wide and strong Tideway. Foreign rowers come to experience quintessential England and soak in the history and lore of the Thames. 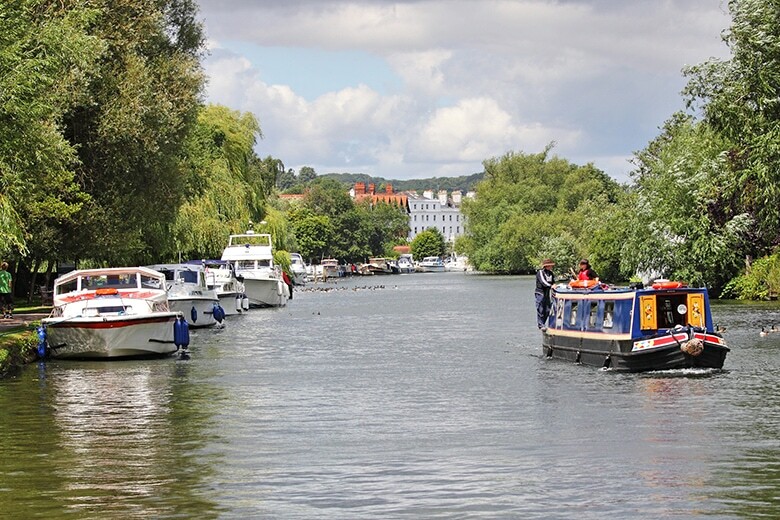 Lonely Planet, the famous guidebook company, recently listed a River Thames rowing trip as one of the world’s great adventures, describing it “like sitting on a conveyor belt watching living history pass you by on both banks”. From all of the possibilities, Rowing The WorldTM has selected a week long row that takes in the highlights of not only Thames rowing but also rowing in England. We stay in cities as famous as the river: Oxford, Henley-on-Thames and Windsor. 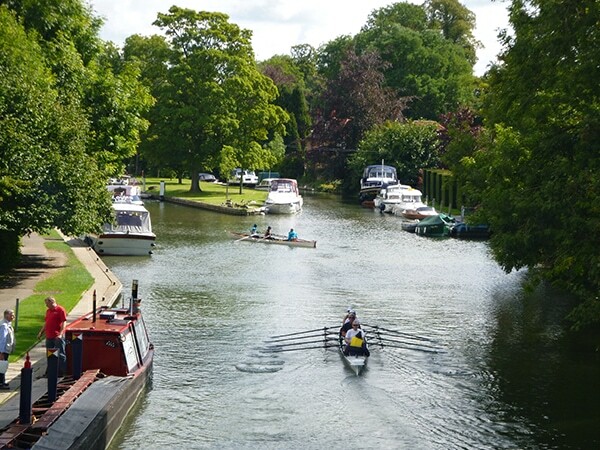 Picture green water meadows, quaint villages, arched bridges, stunning castles and rowing boathouses – more than 200 clubs line the length of the river. On this trip we will immerse ourselves in the sport of rowing, its history and lore as we experience some of the best sculling in the world. Non-rowing companions welcomed. We offer two options. The Fully Independent Non-rower gives you maximum flexibility to structure each day to suit you, while joining the group for evening activities. Our guides will be happy to provide suggestions and advice, but you must provide your own transportation. The second option is Semi-guided Non-rower. The priority of the guides is to support the rowers, and you will be invited to join the rowers at breaks and for lunches. As much as possible, you will be able to enjoy other activities, particular walking or visits to local attractions. Transportation and lunches are included (options for lunches not with the rowers on some days). Please contact us for the details of what is included in the price for each option – we are happy to answer your questions. Guide services and tour support. Trip guided by Vivien Jackson. 8days/7nights with six or seven days of rowing. Arrive in Oxford. Home to one of the world’s most celebrated universities, it is called the “city of dreaming spires”. Golden limestone buildings with sculptures and stonework that almost feel lacy, frame verdant quadrants or lawns. Students hurry past or lazily wander the narrow shop lined streets, books and laptops in hand. In Oxford, the Thames is referred to as Isis, from the ancient name Thamesis. It is beautiful here, intimate and winding and lined by an amazing collection of historic boathouses amidst tall weeping willows, the branches grazing the water. Give yourself time to wander the streets and tow paths, soaking up the atmosphere and history. Welcome dinner and trip briefing. We will also try our hand at punting, another famous Oxford water sport. 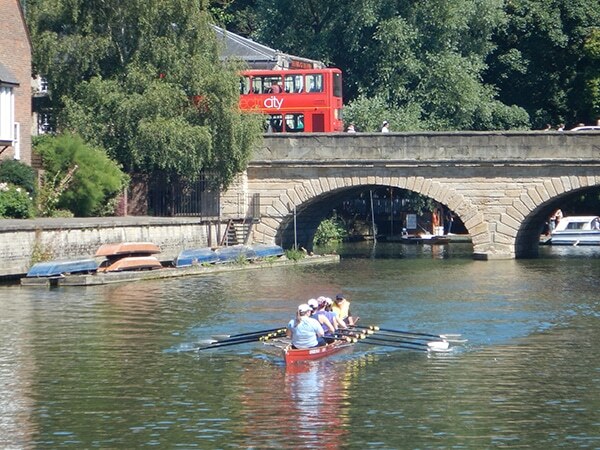 Our first day of Thames rowing has us leaving Oxford in the morning and heading downstream. In fact, we will begin a little bit upstream, allowing us the opportunity to row past the famous boathouses and through the heart of the city. Our destination is Abingdon, 13 km from Oxford. Initially we will still be in “rowing waters”, with the last of the famous college boathouses being Radley College. We will pass through several locks, some dating from as early as 1632. Abingdon is beautiful with its lovely stone bridge and churches and waterside parks. We shuttle to Oxford for a second night of good restaurants, pubs and atmosphere – dinner on your own tonight. From Abingdon we head to Wallingford. We will stop for lunch at a pub where “Three Men in a Boat” was penned, and maybe stroll through the charming village of Clifton Hampden to admire the thatched roof cottages. As the river turns and begins to flow eastward, chalk hills, known as downs, will be visible. Beautiful bridges at Schillingford and Wallingford signal the end of the day’s row of 20 km. Shuttle back to Oxford for a final night and dinner here. Continuing downstream, we pass some of the loveliest scenery of the trip. We row past Goring, Reading and Caversham as well as other small, attractive towns. At the Goring Gap, the Berkshire Downs meet the Chiltern Hills, creating the narrowest part of the Thames Valley. The stretch between Goring and Pangbourne is especially attractive. Forests rise just beyond the river and stately homes line the banks. Nearby is Basildon Park, a National Trust grounds with a beautifully restored Georgian mansion. The total row is 30 km today, ending just beyond Reading. From there it is a short shuttle into Henley-on-Thames. Dinner is on your own tonight, with a wide array of choices to enjoy. A row of 13 km this morning brings us home to Henley. 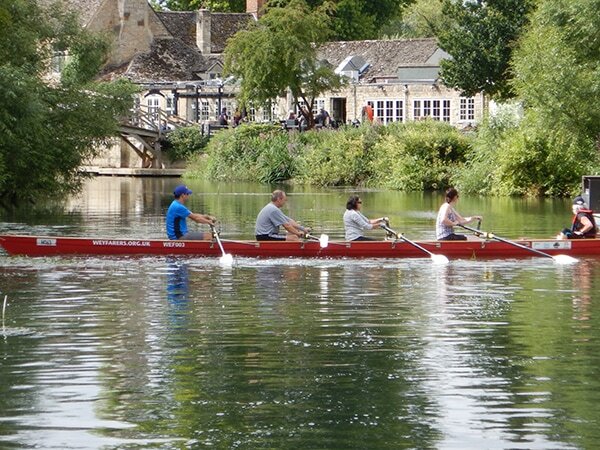 The afternoon is then free for you to enjoy one of the most famous rowing towns in the world. Take time to relax, but be sure to visit the River and Rowing Museum, which showcases the history of the Thames and celebrates a rich rowing tradition. Learn about Doggets Coat and Badge Race. After the museum, wander past storied boat clubs like Leander and drop in at the Regatta headquarters. Find the golden mailbox on Hart Street – recognizing the success of Henley rowers at the 2012 Olympics, including gold medal winners. This evening is a special occasion – we will be given a private tour of Leander and then enjoy dinner in their private dinning room overlooking the river. How many Olympic medals have come from this storied club? You’ll find out. There is so much to see as we row to Eton-Windsor. We will pass beautiful Bisham Abbey, once home to Henry VIII and Elizabeth I, and now the National Sports Centre. Of course famous oarsmen and women have trained and rowed on the same waters that you are sculling on. There are many delightful towns where we could stop for lunch or a coffee, maybe even a pint. 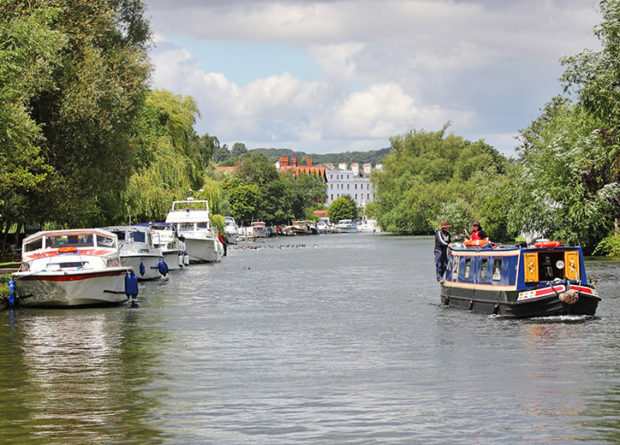 Waterside restaurants and pubs in Marlow, Cookham and Maidenhead have lovely names like Dog & Badger Inn, The Ferry, and The Fat Duck. Our destination is Eton Excelsior Rowing Club 33 km from our start in Henley. It is a short shuttle to our hotel in Windsor. Dinner on your own tonight. We will begin the day by passing Dorney Lake, venue for the 2012 Olympic Regatta. Can you hear the crowds roaring? 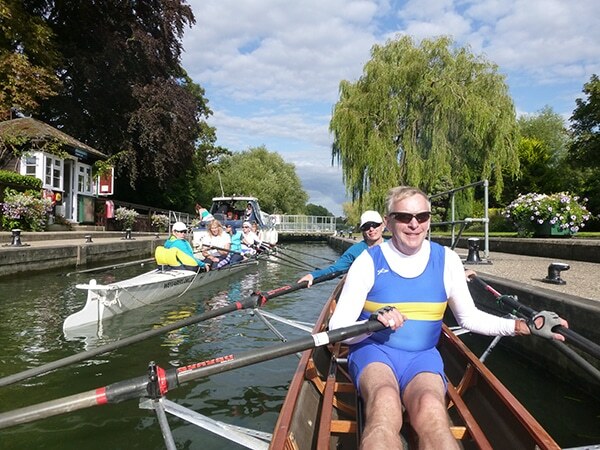 Then a lovely row downstream past Eton College, Windsor Castle and Great Park, Runnymede and Staines, finishing at Weybridge. The Thames has famously been called “Liquid History”. So much of the story of England has unfolded along the banks and on the waters of the Thames, especially along this stretch. This is where the Magna Carta was sealed, battles were fought, and kings, queens, nobility and commoners used the river as a highway to Windsor Castle. The end of our 24 km row is Weybridge where the River Wey joins the Thames among willows, canals and swans. Return for a last night and farewell dinner in Windsor. Today you will bid a fond farewell to the Thames before leaving for your next destination. But there might be a chance for a final day of rowing. 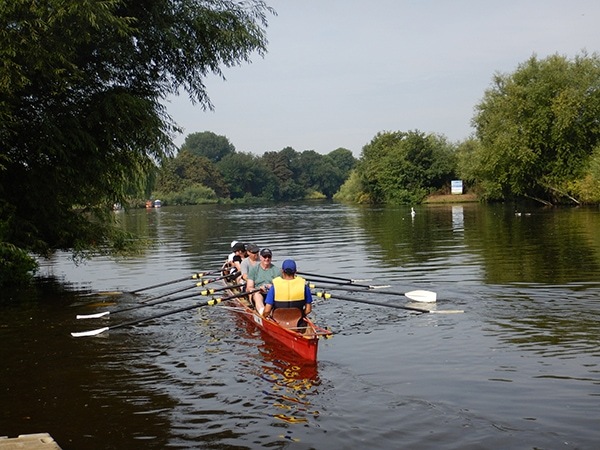 Join local clubs for an optional row downriver from Weybridge, with Hampton Court as our destination. Oh there is just so much beauty, history and wonderful rowing on this iconic river!